Though some religious elements did their best to paint the Christian visitors as a missionary threat, it was clear that the vast majority of Israelis were indeed comforted, whether by coming in direct contact with the pilgrims or witnessing their daily exploits on the evening news. Thousands of Christians ascended to Jerusalem as they do every fall in a show of solidarity with Israel and in anticipation of the prophesied Messianic Age, when all nations will come to celebrate Sukkot, the weeklong biblical Feast of Tabernacles (Zechariah 14:16). 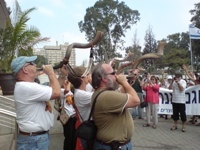 Three Jerusalem-based ministries hosted the pilgrims at events with a similar focus but different approach. With an estimated 6,000 participants, the International Christian Embassy conference at the Jerusalem Convention Center was by far the largest event. In fact, it is the biggest single tourism event of the year in Israel. The “Feast” featured stunning musical productions and speeches by Israeli officials, including Tourism Minister Yitzhak Aharonovitch and nationalist Knesset Member Benny Elon. Across town at Kibbutz Ramat Rachel, Vision for Israel provided the venue of choice for many Israeli believers with its distinctive Jewish flavor. Vision for Israel is a ministry headed by noted Messianic musicians Barry and Batya Segal. Contrasting the indoor events of the other two ministries, the International Christian Zionist Center (ICZC) was determined to interact with Israelis where they are hurting most, and where their biblical inheritance is under greatest threat. In Sderot, which has been hit by thousands of Palestinian rocket attacks from neighboring Gaza over the past five years, wide-eyed locals looked on in wonder as the group’s convoy of buses pulled into town and unloaded hundreds of enthusiastic, Israel-loving Christians. The gesture was well received. As they marched through the streets, the Christians were greeted by grateful police officers, honking and cheering motorists, and weeping mothers who came out of their homes to witness the throng of foreigners who seemed to be the only people in the world concerned about them and their children. At the other end of the spectrum, the group’s reception in Tel Aviv was mixed. The Mediterranean coastal city is a world unto itself where the locals often feel insulated from the dangers in other parts of the country. It is also a bastion of secularism where religion is not always well received or taken seriously. While many greeted the flag-waving, singing Christians with an air of derision, just as many were clearly touched. The ICZC group also visited the vulnerable settlements in Samaria, the Golan Heights and simmering northern border region. In Jerusalem, they held a lively worship service on the ancient steps extending from the southern end of the Temple Mount, much to the chagrin of the Islamic authorities at the Mosque of Al Aksa.